Move oven rack to lowest position. Heat oven to 450°F. Spray 12-inch pizza pan with cooking spray. In large bowl, stir Bisquick mix, water and oil with fork until soft dough forms; beat vigorously 20 strokes. Cover; let stand 8 minutes. Pat or press dough in bottom and 1 inch over side of pizza pan. Place string cheese along edge of dough, overlapping if necessary. Fold 1-inch edge of dough over and around cheese; press to seal. Bake 6 to 7 minutes or until lightly browned around edges. Spread pesto over warm crust. 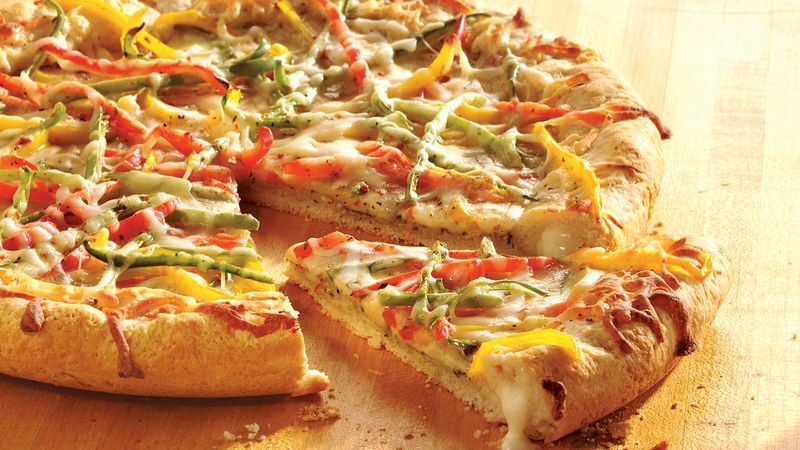 Sprinkle with 1 cup of the mozzarella cheese; top with bell peppers and remaining 3/4 cup cheese. Bake 11 to 14 minutes or until crust is golden brown and cheese is melted. For a heartier version, add 1/4 cup diced smoked ham to the pizza toppings. To add crispness to the crust, sprinkle cornmeal over the greased pan.